Don't expect dainty bites here – the onigiri at Marutoyo come in one size, and one size only: large. 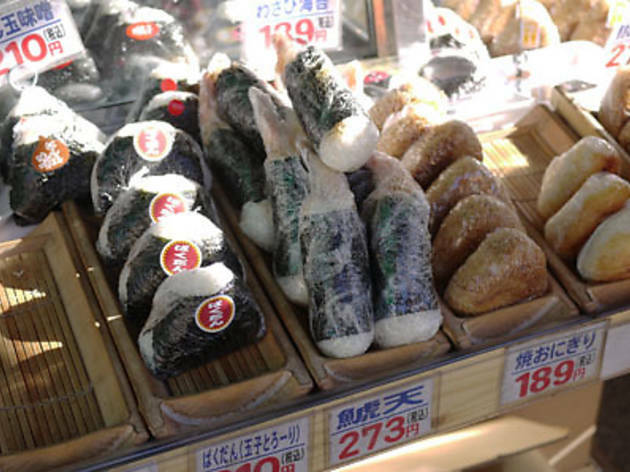 The store carries a wide assortment of rice balls, all filled with Tsukiji-appropriate fillings, including roasted fatty mackerel, shiokara (salted fish innards), nintama miso, oyster, octopus, and clams. 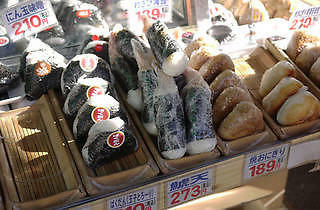 The one that's most likely to satisfy, though, is the shachi-ten, a rice ball filled with a whole fried shrimp.